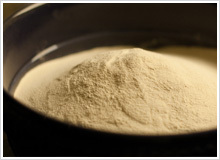 Malt Extract Powder products are made by introducing the liquid malt extract onto a slowly moving band passing through the vacuum. The vacuum allows evaporation to happen at a lower temperature and aids the extract to puff. The resultant honeycomb of material is milled into a coarse powder prior to packing.